Are you going to finish that? There are times where you can pause on a project for months, then return to your art with renewed excited and complete it… but other times you would rather just paint over it. And why not? Perhaps that work taught you about color or composition and those lessons will inform your next work. In fact, you could never be where you are right now without the work that came before… so celebrate and honor its influence by giving yourself permission to move forward. Because that’s what you are doing: growing, learning, making more art. 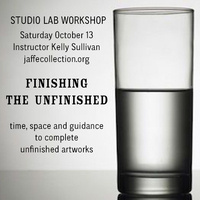 In this studio lab workshop you will be given the time, space, and guidance to finish the unfinished or revisit ideas you just never got to. And guess what? The art you really believe in? You’ll finish. This JCBA workshop is not so much about learning new things as it is about seeing things through and getting the support you need to do that. Tuition: $30. Advance registration is required for all JCBA workshops. To register, email JCBA Director John Cutrone at jcutrone@fau.edu. Sending your email will begin the registration process. Instructor Kelly Sullivan is an arts educator, avid journaler, and the proprietor of local soap company Kelly Soap <www.kellysoap.com>.